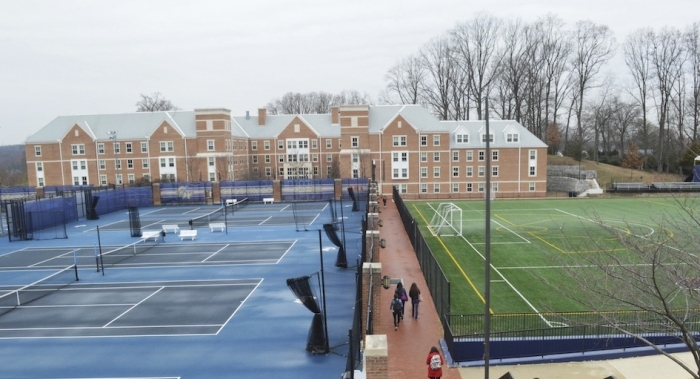 The Mount Vernon Campus Athletic Facility opened in 2001 and is home to the six Colonials' varsity sports: lacrosse, women's soccer, men's soccer, softball, women's tennis, and men's tennis. The facility includes a synthetic turf athletic field for soccer and lacrosse which was renovated in summer 2011, a softball field which was renovated in summer 2015, a six-lane, 25-yard outdoor pool and 11 hard courts for tennis. The varsity athletic facility also includes coaching offices and on-site locker rooms for home and visiting teams, as well as a fully-staffed athletic training room. West Hall is home to our fitness center, open to the general student population.